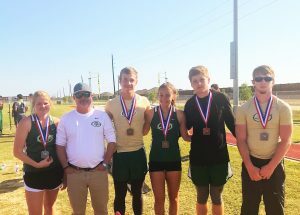 At the Area Track meet on 4/19/2018, five Santa Fe Pole Vaulters medaled and will move on to represent Indian Track and Field at the Region III Championships on 4/27 and 4/28 at Humble ISD’s Turner Stadium. Leading the way on the boys side was Jay Mann who matched his career PR with a 13′ vault – this was enough to win the gold medal and make him Area Champion. Clay Horn finished second and Trent Clark finished third, also medaling and advancing for the Indians. For the girls team, Caitlyn Garza’s vault of 9′ 6″ won the gold on her way to her second consecutive Area Championship. Lexy Greenlaw took home the silver for the Indians and also advanced to regionals.